-Invite friendly, healthy, vaccinated dogs & cats to your home to meet & play with your new puppy. Take your puppy to the homes of these pets, preferably with dog-friendly cats. -Carry your puppy to shopping centers, parks, school playgrounds, etc; places where there are crowds of people & activity. -Take your puppy for short, frequent rides in the car. Stop the car & let your puppy watch the world go by through the window. -Introduce your puppy to umbrellas, paper bags, boxes, the vacuum cleaner & so on. Encourage your puppy to explore and investigate his environment. Praise him when he does. -Introduce your puppy to new and various sounds. Loud, obnoxious sounds should be introduced from a distance and gradually brought closer. Pots & pans are a good place to start; Tap them together lightly to get the puppies attention. He may run at first but when he comes back to investigate, praise him & show him they will not hurt him. If he is reluctant, make a little noise with them, set pans down with a treat inside one and wait for him to approach. -Accustom your puppy to being brushed, bathed, having its nails clipped, teeth and ears cleaned and all the routines of grooming. You and your vet will have a much easier time when it comes time for an exam or similar experience. -Introduce your puppy to stairs, his collar and leash, the doorbell, and the mailman! 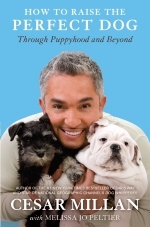 -Introduce anything and everything you want your puppy to be comfortable with when around. If you have a motorcycle, let him hear the engine. If you have a boat, take him with you & sit where he can hear the motor and see the water splash. If you like water sports, introduce him to swimming at an early age. -ANYTHING you are interested in & plan to have your new puppy involved in or around SOCIALIZE him to it between 8-16 weeks of age. A well-bred puppy will have the nerves and temperament to set the stage for success. If you dedicate this time to your new puppy, he/she will pay you back over and over again in the many years to come. You will become the envy of all your friends and others that interact with you & your dog along the way! 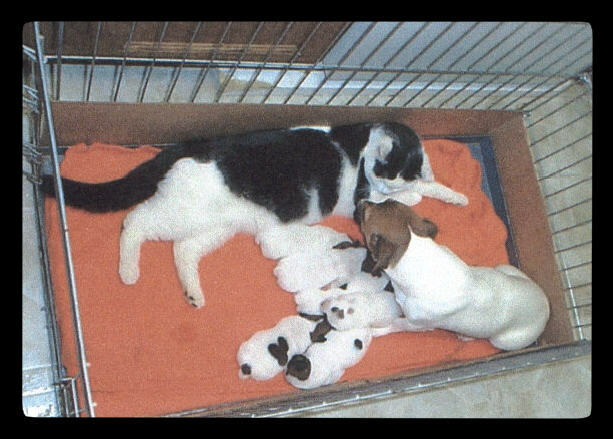 Here is one of our Jacks with a cat - right inside the kennel with the new pups! Our dogs will tolerate trying children, get along with most any animal and downright enjoy being social with everyone! What is a “Puppy Mill”? From the information that I have gathered, I understand that a puppy mill is a dog-breeding establishment that has a mass production of several to many different kinds of dogs. They sell to the wholesale pet industry “By this I mean the Pet Shop and Puppy Brokers”. The dogs and puppies are kept in the most inexpensive conditions. Most are in inadequeate-overcrowded shelter, filth, little to no food, water, or vet care. Their goal is profit, not health or quality. A puppy from this source may be cute, sweet, and cheap. But later when you really love this dog, because of it’s start in life, may cost you heartache and big bucks at the veterinarian office. Plus it keeps this kind of operation in Business. Please!! Lets try to STOP this kind of abuse to animals!!! What is a “Backyard Breeder”? It is my understanding that a backyard breeder is people who usually have a couple of purebred dogs with maybe a litter or two a year to make extra money. You find most of these puppies advertised in the want ads in the newspapers. Many times this means haphazard breeding. 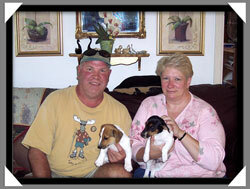 A puppy broker is a person who buys puppies as cheap as possible to resell for high profit. Consequently, a reputable breeder will not sell to them, so they have to buy from puppy mills. This brings quality and health down. An example of this is Pet Shops that sell puppies. Buyer beware, this may hit your pocketbook later. Animal ABUSE often comes in cute puppies!!!! What is a “Reputable, Responsible Breeder”? There are two different kinds of breeders. One is called a "Hobby Breeder". They usually have 5 to 10 of the same kind of dogs and do responsible breeding like the full time professional breeders. Being very conscientious, the breeder breeds for quality, happiness of dogs, welfare and “last but not least” HEALTH. Then there is the reputable and responsible "Professional Breeder". This is a full time kennel, usually of 1 or 2 kinds of dogs. Both the hobbyist and the kennel breeder breed to make a profit but their first concern is the welfare of their dogs. "Usually"!!! Be sure that you really like and trust the Breeder you are going to do business with. 1. One who offers at least a two-week satisfaction return policy? 2. One who offers a health guarantee? 3. One whose kennel has an open book policy. 4. One who has a good food policy? 5. One who offers a lifetime return policy? 6. One who offers up to date shots and worming. 7. One who offers pedigree papers? 8. One who offers bill of sale and guarantee in writing? 9. One who will give their vet’s name and phone number. 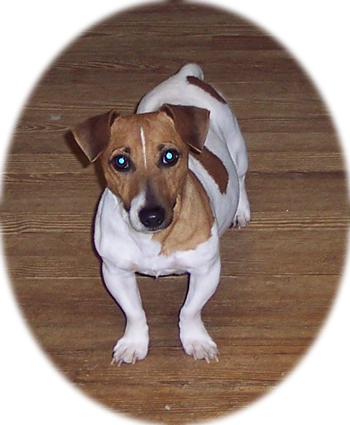 On this page you will find all kinds of tips to make you an informed buyer and also an informed owner, & Trainer, for your Jack Russell Terrier Puppies or Irish Jack Russell Terrier Puppies. Of course this in not the only source of information. I am always available for questions. Also, at the end of this page are other source of info you may be interested in. I do hope you will take the time to read this information. 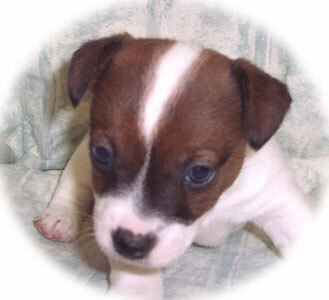 Jack Russell Terrier came to be. A man by the name of Parson John Russell of Great Britain in the 1800's, selectively bred different dogs to come up with the Jack Russell Terrier. He wanted to create a small dog the size of a fox to go into a fox hole, (where the fox would go to retreat from the hounds & horses) and get the fox out so the Fox Hunt could continue. Some times when a litter was born a Short Leg Jack would be in the litter. These little guys could not compete with a fox the way the Parson Jack Russell could on a Hunt, but they were good around the barn to be the little raters. And as we understand these little guys were known to be calmer than the Parson Jack. 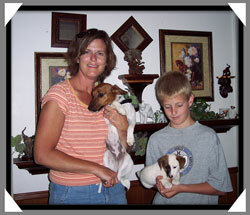 So the Short Leg Jack Russell Terrier became the dog to stay home to be the Family dog. One day someone decided to take some of the Short Leg Jack Russell's to Ireland and breed them there. They are found throughout Ireland, mostly on farms. 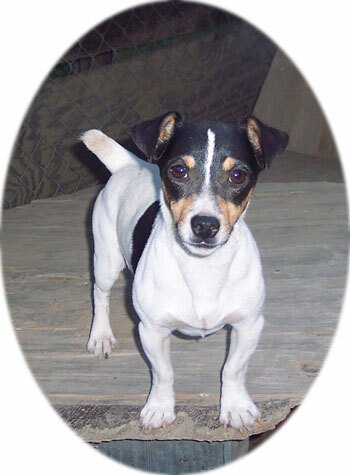 The Irish Jack Russell Terrier usually has a thin Short leg, and thin chest, like the Parson Jack Russell. 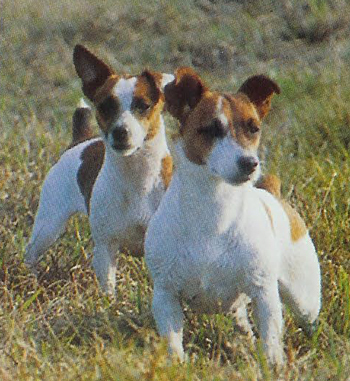 One day someone decided to take some of these calm Short Leg Jack Russell's to Australia and breed them there. The only difference in the Irish and Australian Jack Russell Terrier is the muscle tone of the leg and chest. The Australian Jack usually has a thicker leg and thicker more muscular body. Please remember (You can breed mean in and you can breed mean out, You can breed calm in and you can breed calm out.) The calm, good natured temperament comes from breeding this quality. Most Puddin Jacks Russell's have somewhat of a bowed front legs. This is normal for a Shorty Jack. Some are more bowed than others. and some have straight legs. There are four different types of ear set for Pet Quality Jacks Russell Terrier. 1) Small V shape close to head. Some jacks are ambidextrous, with their ears. They will put them up or down, depending on their mood. "Now you have a Jack Russell Puppy"
"What are you going to do with it"? will make your new family member the best it can be!!! Spaying your female stops the hormone (merry-go round) for her and will help her to have an even temperament. Plus it will lesson the chance of her having Mammy Tumors. 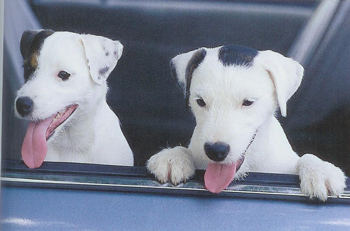 "Why Training for a Jack Russell Terrier"? 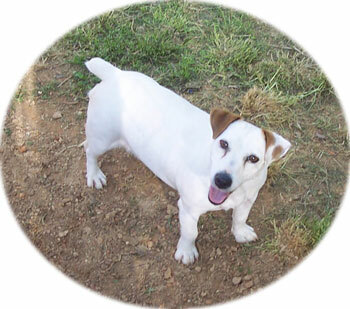 A happy Jack Russell is one who is trained and second in the pecking order, under his owner. A happy Jack Russell Owner is one who has a well trained Jack Russell. A Jack Russell is like a child, it needs structure and training. "The Difference between a Dog in a Crate and Crate Training"!! Crate training is done to teach the puppy or dog that they can hold going to pottie through the night first. And then some short intrivals during the day. There are some good books and trainers that can teach you how to do this. And I will talk to you in leight about the differant methods of teaching your dog or puppy how to tell you that he or she needs to go out side. This is a must do. 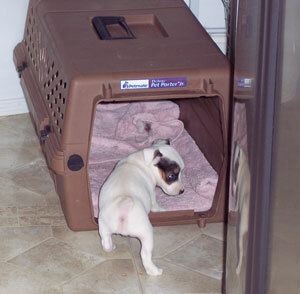 A Jack Russell or any kind of dog can not stay in a crate all day and all night. Day time is PLAY TIME. A Dog in the crate all day is a bad thing to do. This is a Dog in a crate. 24-7. They, you, dogs, and puppies would not be happy or Healthy. The day hours are for play, running, and learning. Crate training is important. So Learn the best way to train your puppy or dog. A crate is used for Sleep time, Nap time and time out, time. But never as a punishment or an all day thing. If I can help with questions, please call. Togather we will find the right soluation for your Puppy or Dog when you are working!!! I believe everything deserves good health, and this begins with good food. Every thing can have food allergies and dogs are no exception. Food allergies can cause numerous things in dogs, such as Aggression, Hair Loss, Itching, plus overall Bad Health. Dog food is like everything else, when you get to many products out there for consumers to choose from the quality to that product start to go down. The cheaper quality ingredients makes it look more inviting to buy for our pets. But you will trade off for more Vet bills when your pet becomes unhealthy from cheap food and cheap quality. Here are some Links so that you can read for yourself and you decide how you want to spend your money and how this will effect your new or old family member. 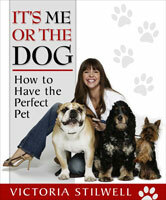 I recommend all new and old pet owners to read the articles that link to these web sites. 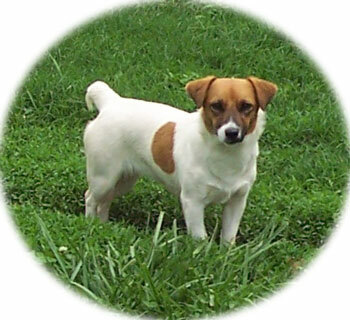 Australian - Irish Short Leg Jack Russell Terrier. 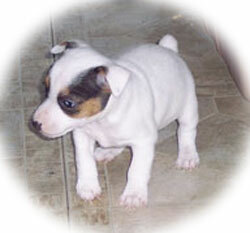 Specializing in Short Leg Jack Russell Terrier Puppies, bred for family life with calm temperament. We are also very proud of our Irish Jack Russell line. I Toured Ireland to chose my Breeding Stock. 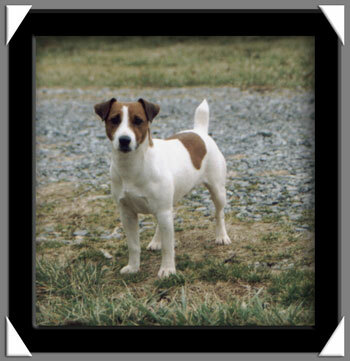 working Parsons Jack Russell Terrier breed, to keep it free of genetic faults and characteristics. Unlike other registries which register entire litters at birth, each application for registration in the JRTCA is judged on the individual Jack's merits. The AKC is an All Breed registry which registers individual breed dogs if the parents are registered or whole litters if the parents are registered. If you want to have your dog in Show, or if you want to Breed and sell to Show people, or Sell to other Breeders. This may be your choice of Kennel Club. 2) Dog foods can cause problems!! 5) Why does my dog eat his poop? 6) Why does my dog eat grass? This site has many good articles, but these you need to read. Now that you have read about commercial Dog Foods, I hope you will have a better idea what you want to feed your new puppy or dog. If you would like call me and we can go over what and how I feed my dogs and puppies. Life is short enough for our four legged friends and what we feed them can mean how Long and Healthy that life will be. The links and articles within are important!! You may want to click on each to check our their individual Registry requirements, to see what means the most to you and your needs.